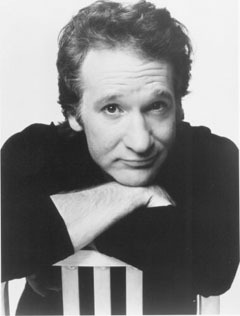 Bill Maher was born in New York City, and grew up in New Jersey. His father was Catholic, a newsman with a sense of humor who told jokes around the house. His mother was Jewish, a nurse, generally quiet and serious. As a young boy, Maher was too shy to make many friends. While attending college at Cornell, Maher tried stand-up at New York's famous Catch a Rising Star night club. He was terrified and not terribly funny, but it wasn't a disaster. He hung out at the club for several years, getting to know the comedy business, and getting better at it. Maher eventually landed the emcee job at the club, which quickly got him noticed by a talent scout for Johnny Carson's Tonight Show. He made numerous appearances on Tonight, always funny and always invited back, but Maher felt constrained by the show's rules -- every comedian's material was vetted in advance down to the smallest detail, and anything political had to be inoffensive to every important demographic. The banter between guest and host was largely based on pre-interviews with staff members. Maher had an itch to try something more spontaneous. D'SOUZA: Bill, there's another piece of political correctness I want to mention. And, although I think Bush has been doing a great job, one of the themes we hear constantly is that the people who did this are cowards. D'SOUZA: Not true. Look at what they did. First of all, you have a whole bunch of guys who are willing to give their life. None of them backed out. All of them slammed themselves into pieces of concrete. D'SOUZA: These are warriors. And we have to realize that the principles of our way of life are in conflict with people in the world. And so -- I mean, I'm all for understanding the sociological causes of this, but we should not blame the victim. Americans shouldn't blame themselves because other people want to bomb them. MAHER: But also, we should -- we have been the cowards lobbing cruise missiles from 2,000 miles away. That's cowardly. Staying in the airplane when it hits the building, say what you want about it, it's not cowardly. You're right. Sears and Federal Express immediately yanked their ads from the show, and 17 local ABC stations stopped airing Politically Incorrect. Instead of making its usual profit for the network, Maher's show was suddenly costing more than it earned. Maher made a semi-apology to people who had misconstrued his remarks, and the show limped along for several months before the axe quietly fell. Maher quickly started a similar show on HBO, Real Time, aired live for an hour weekly. The new show sports Maher still saying what he thinks, with three guests instead of four -- and no sponsors or affiliates to offend. Interview with Jon Stewart, The Daily Show, 30 September 2008: "I don't say there's no God, I'm not an atheist because I find atheism to be a mirror of the certainty of religion and I don't like certainty about the next world because we can't know... What I say is I don't know."